“Fast Jack” Beckman is living up to his name at the Gatornationals this weekend. Jack Beckman and his team of tuning wizards secured the No. 1 qualifying spot in Funny Car as time trials concluded before an announced sellout crowd Saturday for the 49th annual AMALIE Motor Oil NHRA Gatornationals at Gainesville Raceway. Veteran tuners Dean Antonelli, John Medlen and Neal Strausbaugh watched Beckman’s 1,000-foot pass in 3.911-seconds at 332.18 mph from Q2 on Friday hold up as best of the weekend. Beckman secured his first pole of the season, second at the historic Florida facility and 24th of his career. After posting two class-best runs Friday, Beckman made two more respectable passes during the third and fourth rounds on Saturday. While not low E.T. of the session, Beckman’s 4.025-second pass was fourth-best of Q3 and his 4.007-second lap from Q4 earned one bonus point for third-quickest. Clay Millican (Top Fuel), Greg Anderson (Pro Stock) and Andrew Hines (Pro Stock Motorcycle) also emerged as No. 1 qualifiers in their respective categories at the third of 24 events on the 2018 NHRA Mello Yello Drag Racing Series schedule. The Gatornats is the season’s traditional East Coast tour season-opener and most closely associated with NHRA legend “Big Daddy” Don Garlits of Ocala, Fla.
With conditions forecast Sunday similar to Friday, Beckman is confident he can wheel Terry and Doug Chandler’s Infinite Hero Foundation Dodge Charger R/T into the winner’s circle. “It is a difficult track,” said “Fast Jack,” the 2012 world champion for Don Schumacher Racing. “The conditions for first round will be very similar to Friday’s first qualifying session, and I think we’ll tune off of that one. “I love the fact that we did everything pretty darn good for four runs over the course of the two days here. I think it gives us a leg-up going into Sunday. We’ll have lane-choice and we’ll get to pick when we’re going to run. We could make a poor decision, but I like that it’s our decision to make. Beckman’s bid for his first Gatornationals Wally trophy will begin against No. 16 qualifier Jim Campbell. Arizona Nationals winner Courtney Force of arch-rival John Force Racing locked-in the No. 2 spot after running 3.914-seconds at 327.66 mph in her Advance Auto Parts Chevrolet Camaro SS. Teammate and two-time/reigning Funny Car world champion Robert Hight is seeded third in his Auto Club of Southern California Camaro. After riding-out three engine explosions in the season’s first three events, John Force made two early shutoff passes Saturday but still was able to qualify 15th via his 4.281-second run at 222.88 mph from Friday. A 16-time world champion, Force will line up against daughter Courtney in Round 1. “I have to be honest, we’re still walking with this race car,” said Brute Force, driver of the PEAK Coolant and Motor Oil Chevrolet Camaro SS. “(Friday) we went to 500-feet and then we went to 700-feet and it blew up. We made changes and went to 500-feet without problems and today we made a second qualifying run and ran to 500-feet and the motor looked beautiful. Recall that Force is an eight-time Gatornationals winner. “I’m banking on the experience of the people around me,” Force said. “I’m the kind of guy that, when it’s qualifying day, I run it to the edge. I run it even if I know it will hurt itself. I’m re-thinking all that. What I’m looking at is the long haul. To go out here and say I have to win this race or I have to qualify low after as much stuff as we have put on the ground in Pomona and Phoenix and then to come here and do it again is bad. Millican’s second round 1,000-foot qualifying pass of 3.708-seconds at 324.98 mph in the Parts Plus/Great Clips dragster stood strong Saturday for the No. 1 Top Fuel spot. Millican earned his second pole of the season and 12th of his career. 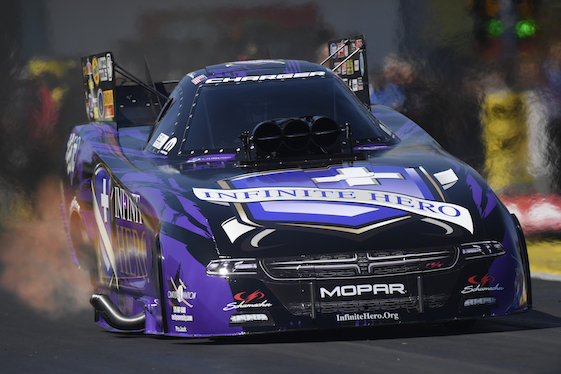 Millican won his first NHRA national event last season at Bristol (Tenn.) Dragway and also set the elapsed time record at Gateway Motorsports Park in Madison, Ill.
Millican will face Terry Totten Sunday morning in the first round. Steve Torrence sits in the No. 2 position after a pass of 3.739-seconds at 323.19 mph in his Capco Contractors/Torrence Racing dragster. Three-time world champion Antron Brown of DSR qualified third in his Matco Tools dragster tuned by Brian Corradi. Anderson remained atop the Pro Stock field Saturday with his Q2 Friday quarter-mile pass of 6.522-seconds at 213.00 mph in the red Summit Racing Equipment Chevrolet Camaro SS. Competing in his 20th season in the Factory Hot Rod class, Anderson is chasing his fifth victory at Gainesville and 91st of his career. “It was a little bit tougher today, a little bit warmer and a little bit more humid,” said Anderson, who earned his fifth Gatornationals pole. “We knew it coming into today, though. We were a couple of hundredths behind but we still have a great tune-up for tomorrow. A four-time world champion, Anderson will race Wally Stroupe and his Camaro in Round 1. Alex Laughlin powered his Gas Monkey Energy Camaro into the No. 2 spot while fellow-Texan and Arizona Nationals winner Chris McGaha qualified third in his Harlow Sammons Camaro. In Pro Stock Motorcycle, Hines raced to the top of the two-wheel category during the fourth qualifying round with his quarter-mile pass of 6.773-seconds at 198.64 mph aboard his Screamin’ Eagle Vance & Hines Harley-Davidson Street Rod. Hines, who recorded his last victory at Gainesville in 2004, was the event runnerup last March. “Last year we figured out how to get our Street Rods off the starting line a lot more consistently,” said Hines, a five-time world champion. “Coming here it was just a progression of taking our notes from last year and just making sure we’re making the proper calls at the right time.” Hines will race Mark Paquette and his Victory in Round 1. Eddie Krawiec, the four-time/reigning PSM world champ and Hines’ H-D Street Rod teammate, qualified second and will race 2010 world champ LE Tonglet and his Suzuki. Meanwhile, Hector Arana Jr. _ who broke the 200 mph barrier with a pass in 6.937-seconds at 200.23 during Friday’s opening session _ qualified fourth with a second 200 mph lap aboard his Lucas Oil Buell. Hector Jr., who ran 6.806-seconds at 201.01 mph Saturday, will open against Cory Reed and his Victory when eliminations begin at 11 a.m. (EDT) Sunday. FOX Sports 1 will air three hours of coverage beginning at 7 p.m. (EDT). Top Fuel _ 1. Clay Millican, 3.708-seconds, 324.98 mph vs. 16. Terry Totten, 7.106, 96.49; 2. Steve Torrence, 3.739, 323.19 vs. 15. Mike Salinas, 5.557, 117.91; 3. Antron Brown, 3.751, 327.74 vs. 14. Audrey Worm, 5.133, 137.96; 4. Tony Schumacher, 3.785, 329.67 vs. 13. Brittany Force, 5.021, 138.17; 5. Pat Dakin, 3.810, 291.26 vs. 12. Shawn Reed, 4.128, 239.74; 6. Leah Pritchett, 3.811, 325.77 vs. 11. Terry Haddock, 4.038, 252.90; 7. Doug Kalitta, 3.827, 327.19 vs. 10. Richie Crampton, 3.942, 305.49; 8. Terry McMillen, 3.830, 320.74 vs. 9. Scott Palmer, 3.889, 316.08. Funny Car _ 1. Jack Beckman, Dodge Charger, 3.911, 332.18 vs. 16. Jim Campbell, Charger, 5.142, 156.37; 2. Courtney Force, Chevy Camaro, 3.914, 327.66 vs. 15. John Force, Camaro, 4.281, 222.88; 3. Robert Hight, Camaro, 3.917, 333.66 vs. 14. Dave Richards, Ford Mustang, 4.133, 300.93; 4. Shawn Langdon, Toyota Camry, 3.926, 327.03 vs. 13. Gary Densham, Mustang, 4.089, 308.57; 5. Tommy Johnson Jr., Charger, 3.933, 327.27 vs. 12. Cruz Pedregon, Camry, 4.084, 290.26; 6. Matt Hagan, Charger, 3.941, 328.22 vs. 11. Tim Wilkerson, Mustang, 4.004, 315.05; 7. Ron Capps, Charger, 3.944, 325.06 vs. 10. Bob Tasca III, Mustang, 3.989, 321.58; 8. J.R. Todd, Camry, 3.962, 326.40 vs. 9. Del Worsham, Camry, 3.979, 325.14. Did Not Qualify _ 17. Cory Lee, 8.943, 85.95; 18. Jonnie Lindberg, 9.393, 80.65. Pro Stock _ 1. Greg Anderson, Chevy Camaro, 6.522, 213.00 vs. 16. Wally Stroupe, Camaro, 7.042, 196.73; 2. Alex Laughlin, Camaro, 6.525, 212.59 vs. 15. Val Smeland, Camaro, 6.664, 209.36; 3. Chris McGaha, Camaro, 6.529, 213.27 vs. 14. John Gaydosh Jr., Camaro, 6.612, 211.03; 4. Jason Line, Camaro, 6.534, 213.03 vs. 13. Alan Prusiensky, Dodge Dart, 6.602, 210.24; 5. Bo Butner, Camaro, 6.534, 212.93 vs. 12. Jeg Coughlin Jr., Camaro, 6.581, 209.75; 6. Deric Kramer, Camaro, 6.541, 212.59 vs. 11. Tanner Gray, Camaro, 6.571, 212.83; 7. Vincent Nobile, Camaro, 6.541, 212.69 vs. 10. Kenny Delco, Camaro, 6.570, 211.53; 8. Drew Skillman, Camaro, 6.544, 212.83 vs. 9. Erica Enders, Camaro, 6.554, 212.06. Pro Stock Motorcycle _ 1. Andrew Hines, Harley-Davidson, 6.773, 199.05 vs. 16. Mark Paquette, Victory, 6.943, 193.21; 2. Eddie Krawiec, Harley-Davidson, 6.785, 199.67 vs. 15. LE Tonglet, Suzuki, 6.929, 196.64; 3. Joey Gladstone, Suzuki, 6.793, 196.93 vs. 14. Hector Arana, Buell, 6.917, 198.64; 4. Hector Arana Jr., Buell, 6.806, 201.01 vs. 13. Cory Reed, Victory, 6.910, 191.67; 5. Scotty Pollacheck, Suzuki, 6.816, 197.51 vs. 12. Jim Underdahl, Suzuki, 6.902, 195.59; 6. Jerry Savoie, Suzuki, 6.821, 196.50 vs. 11. Karen Stoffer, Suzuki, 6.889, 195.14; 7. Steve Johnson, Suzuki, 6.855, 197.74 vs. 10. Angie Smith, Buell, 6.889, 196.10; 8. Angelle Sampey, Victory, 6.856, 196.07 vs. 9. Ryan Oehler, Buell, 6.881, 195.22. Did Not Qualify _ 17. Matt Smith, 6.945, 195.87; 18. Kelly Clontz, 6.970, 192.11; 19. Lance Bonham, 7.205, 694.44; 20. Andie Rawlings, 7.223, 182.45. Mike Castellana qualified on-pole Saturday during the E3 Spark Plugs NHRA Pro Mod Drag Racing Series presented by J&A Service portion of the Gatornationals. This weekend’s Pro Mod racing, presented Jerry Bickel Race Cars, is the first of 12 scheduled events. Castellana ran the quarter-mile in 5.750-seconds at 253.56 mph in the fourth session in his Al Anabi Racing ’69 Chevrolet Camaro to take the No. 1 slot. Steve Jackson qualified second at 5.754-seconds at 250.60 mph while Shane Molinari is third with numbers of 5.771 at 256.16 for Sunday’s eliminations. Pro Modified _ 1. Mike Castellana, Chevy Camaro, 5.750, 253.56 vs. 16. Carl Stevens, Camaro, 5.832, 254.47; 2. Steve Jackson, Camaro, 5.754, 250.60 vs. 15. Jose Gonzalez, Camaro, 5.830, 256.45; 3. Shane Molinari, Pontiac Firebird, 5.771, 256.16 vs. 14. Doug Winters, Chevy Chevelle, 5.829, 246.75; 4. Rickie Smith, Camaro, 5.776, 250.64 vs. 13. Bob Rahaim, Camaro, 5.823, 246.30; 5. Steven Whiteley, Cadillac CTS-V, 5.787, 253.47 vs. 12. Jim Whiteley, Camaro, 5.801, 248.11; 6. Mike Janis, Camaro, 5.787, 248.84 vs. 11. Dan Stevenson, Camaro, 5.801, 255.34; 7. Chad Green, Chevy Corvette, 5.793, 248.93 vs. 10. Khalid alBalooshi, Camaro, 5.800, 250.92; 8. Todd Tutterow, Camaro, 5.795, 249.72 vs. 9. Jeremy Ray, Corvette, 5.798, 247.66. Did Not Qualify _ 17. Sidnei Frigo, 5.843, 253.71; 18. Pete Farber, 5.847, 246.30; 19. Michael Biehle, 5.854, 252.52; 20. Jeffery Barker, 5.859, 254.42; 21. Chuck Little, 5.860, 246.39; 22. Rick Hord, 5.875, 248.80; 23. Danny Rowe, 5.882, 247.61; 24. Harry Hruska, 5.884, 250.37; 25. Melanie Salemi, 5.905, 243.24; 26. Eric Latino, 5.918, 247.47; 27. Kenny Lang, 5.936, 243.63; 28. Steve Matusek, 5.963, 246.71; 29. Bill Glidden, 6.013, 235.47; 30. Chip King, 6.021, 243.99; 31. Richie Stevens, 6.051, 231.36; 32. Rick Distefano, 6.149, 240.89; 33. Clint Satterfield, 6.542, 238.93; 34. Brandon Pesz, 7.398, 132.33; 35. Ruben Tetsoshvili, 11.255, 66.07.